John Philip Sousa’s Christmas Gift to the United States. 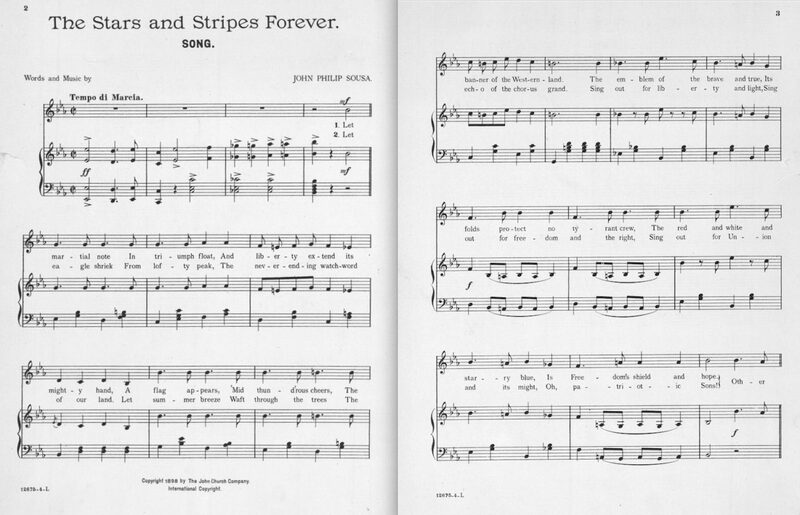 We may think of “The Stars and Stripes Forever!” around Independence Day, but did you know it was written around Christmas? 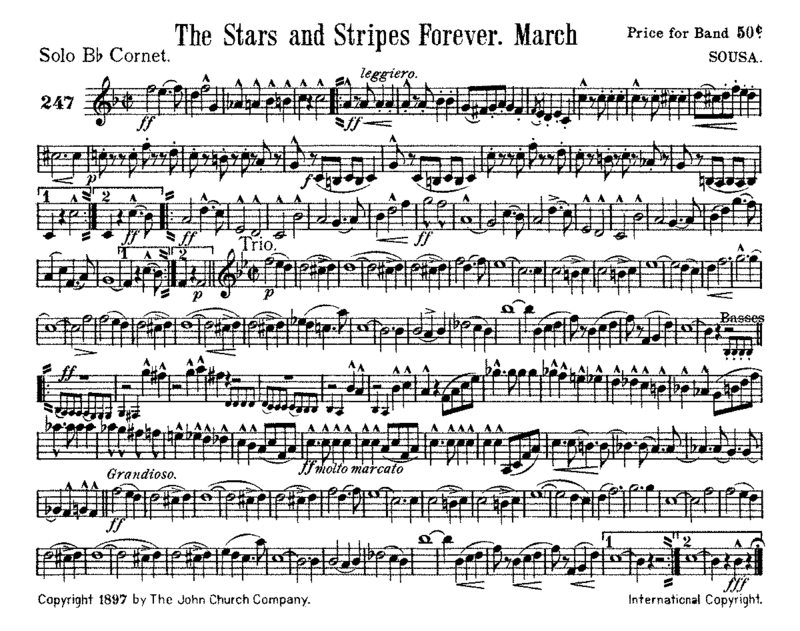 “The Stars and Stripes Forever” is certainly America’s greatest march. It is associated with the United States and recognized everywhere in the world. The march was not born in the aftermath of a great battle (like “The Star-Spangled Banner”) but, like our national anthem, is the result of a vision of the American flag flying on a staff. 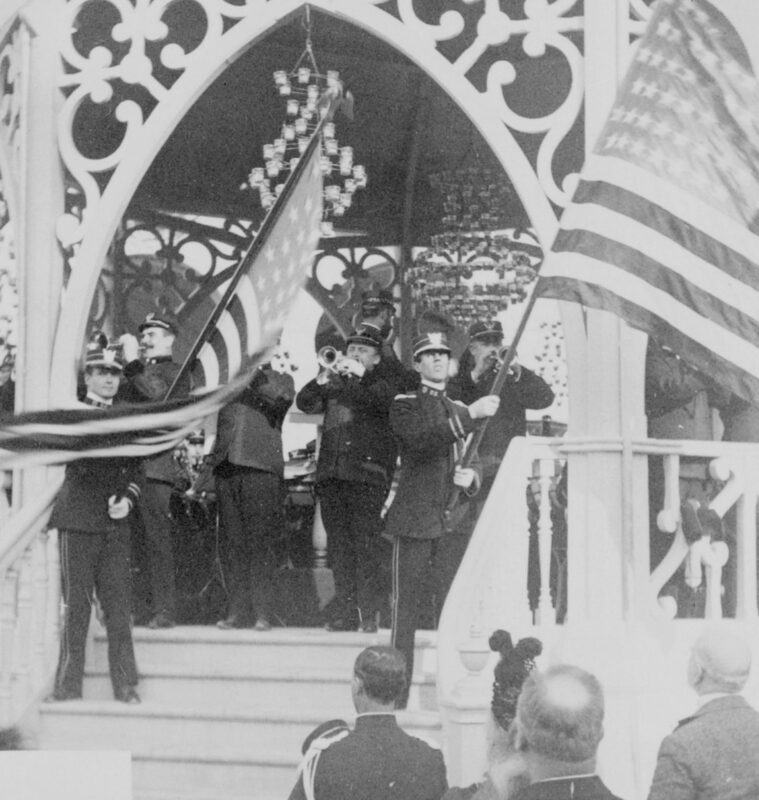 We may celebrate the birth of the United States every July 4th with the playing of “The Stars and Stripes Forever” but we pause at this season to remember John Philip Sousa’s Christmas gift to the United States. 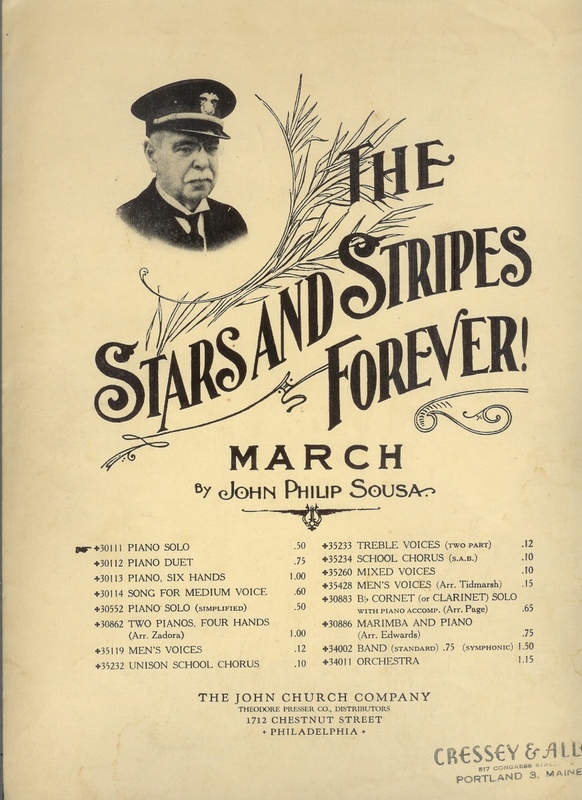 In his autobiography, “Marching Along” written in 1928, John Philip Sousa wrote that he composed the march “The Stars and Stripes Forever” on Christmas Day, 1896. Sousa had composed the march in his head and committed the notes to paper after his arrival in the United States. The new march was first performed at The Academy of Music in Philadelphia (not Willow Grove Park, just outside Philadelphia, as reported in some other places) on May 14, 1897, and was immediately greeted with great enthusiasm. 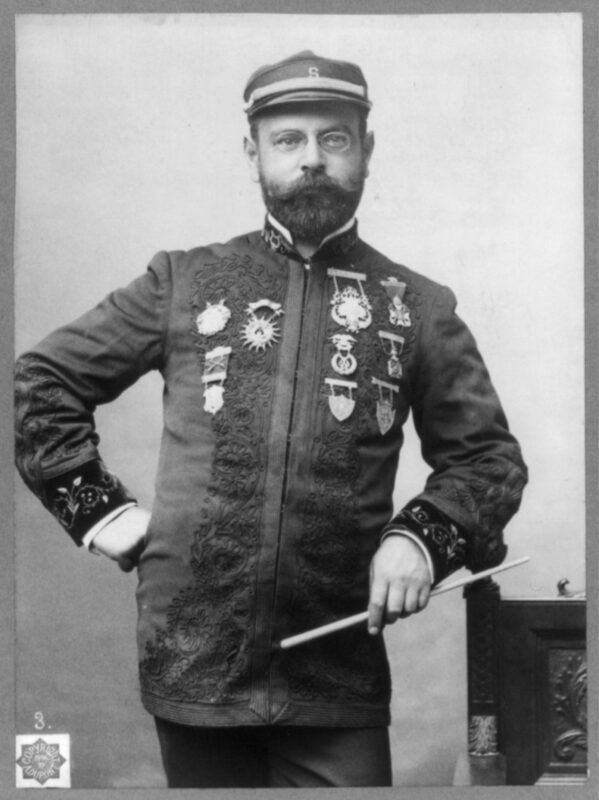 Sousa had left the United States Marine Band in 1892 after 12 years in service to the nation as the Director of the “President’s Own” to form his own civilian organization. During his time with the Marine Band he produced some of his greatest marches including “Semper Fidelis” (1888), “The Thunderer” (1889) and “The Washington Post” (1889). His new band enjoyed great success and it toured the nation to great acclaim. After four years of touring which included some major concerts and the premier of his operetta “El Capitan”, Sousa and his wife left for a vacation trip to Europe in September 1896. They were in Naples when they saw a startling newspaper article. Sousa’s band manager, David Blakely, had passed on November 7th having been found dead in his Carnegie Hall office. The news was shocking as Blakely had been the person responsible for the Sousa Band tours and the one who persuaded Sousa to leave the Marine Corps. Sousa and his wife headed home to New York, leaving from Liverpool, England aboard the SS Teutonic on November 18 and arriving in New York City on the 25th. (or possibly the 26th according to the SS Teutonic schedule found at http://www.norwayheritage.com/p_ship.asp?sh=teuto) This would make sense as a Sousa Band tour was set to start on December 27th. Interestingly this was the same owner and builder of the RMS Titanic, the ship that would meet its fate in 1912. 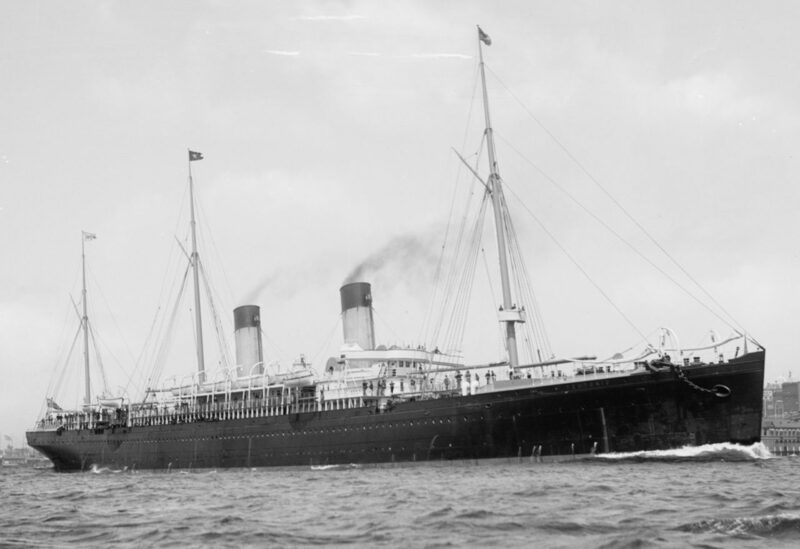 The S.S. Teutonic. Note the US Flag flying at the foremast. It is most certain that during the trip Sousa would have looked up at the foremast where the flag of the United States flew. 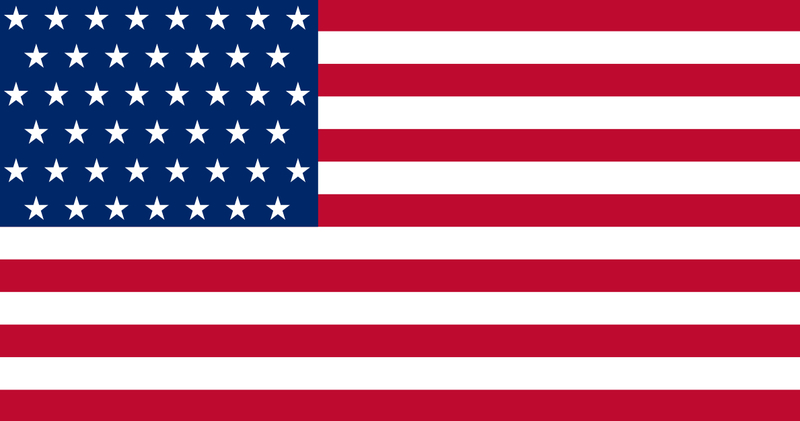 In 1896 this would have been the 45-Star flag (Utah having been admitted on January 4, 1896). Why would the US Flag be flying on a British liner? The foremast is where the flag of the ship’s destination flew. Sometimes (but incorrectly) referred to as the “destination flag”, the flying of a “courtesy flag” or “courtesy ensign”, is the ensign of another country flown when entering that country’s port and during the ship’s entire time in port. This flag is flown also during the voyage. This courtesy is done as means of honoring that country. Conversely, failing to do so was considered highly disrespectful, especially for naval vessels. It must have been the sight of the flag fluttering in the breeze that inspired the music that went through his head. “In a kind of dreamy way, I used to think over old days at Washington when I was leader of the Marine Band … when we played at all public functions, and I could see the Stars and Stripes flying from the flagstaff in the grounds of the White House just as plainly as if I were back there again….Then I began to think of all the countries I had visited, of the foreign people I had met, of the vast differences between America and American people and other countries and other peoples, and that flag our ours became glorified … and to my imagination it seemed to be the biggest, grandest, flag in the world, and I could not get back under it quick enough. What is interesting in the story is that Sousa arrived in New York on November 26, yet waited almost a full month before setting the tune that was in his head down on paper. If one was to believe Sousa rushed from the ship and wrote it immediately after docking, one would have to go back to the ships records. The records show the ship arriving on November 25. The Teutonic made another voyage in December, arriving in New York on December 23rd. This would fit into the story quite well, having Sousa leave the ship and setting the music to paper two days later. However, the five-month concert tour was set to start on the 27th and certainly Sousa would have needed time to prepare the band and himself for the long and arduous road trip. Plus Sousa’s arrival in New York was mentioned in the “Theatrical Gossip” column of the New York Times on November 27, 1896. He waited a month before writing the march, yet his 1915 interview seems to indicate that he wrote the composition while on the ship. There are contradictions in his stories. 1. Write the piece onboard the ship? 2. Write it “when we reached shore”? 3. Wait a month before writing it down? Sousa never claimed to write the music immediately after arriving so we must assume he waited a month before writing out the piano score that would become the skeleton for the full band arrangement. As a writer, Sousa worked several stages when composing a march. Usually a sketch was done of ideas for a musical composition, then a piano score was done. The piano score was then put into a full score format from which copyists would write out individual parts for the band members. The march would be turned into other versions such as a piano solo for publication and orchestral arrangements usually set in a key to suit orchestras. Unfortunately there are no sketches for “The Stars and Stripes Forever.” This is disappointing as Sousa would jot down ideas as they came to him, whether it be at home, in a hotel room, at dinner, or on a train. Many sketches to other works survive. There are three original scores that survive. 1. An untitled pencil piano score signed and dated xmas 1896. 2. An ink piano score signed and dated xmas 1896. 3. A full score signed and dated April 26, ’97 Boston. 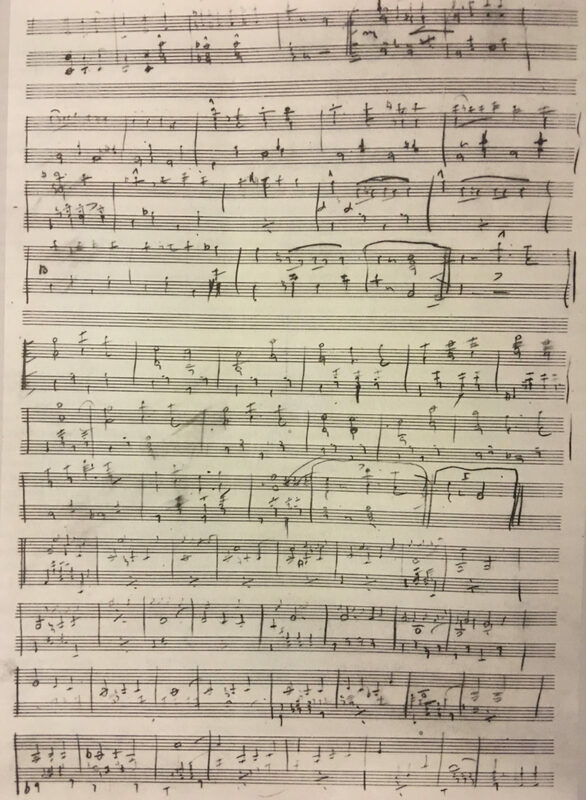 James R. Smart in his article “Genesis of a March The Stars and Stripes Forever” puts that the pencil score (which he discovered in the Library of Congress) and the ink score were both done on Christmas Day 1896. It is possible Sousa may have written down a few ideas as a sketch (unfortunately lost) and then did the untitled pencil piano score before Christmas Day and then inked out the two-page piano score signed and dated “xmas 1896.” But considering his very busy schedule between his arrival and Christmas Sousa would have had little time. There were rehearsal and tour arrangements to be done in the absence of David Blakely. But since both are dated Christmas Day, we must assume that is when they were completed. One thing to mention is that Sousa did not always put a title on a new march until its first performance or sometimes just before publication. 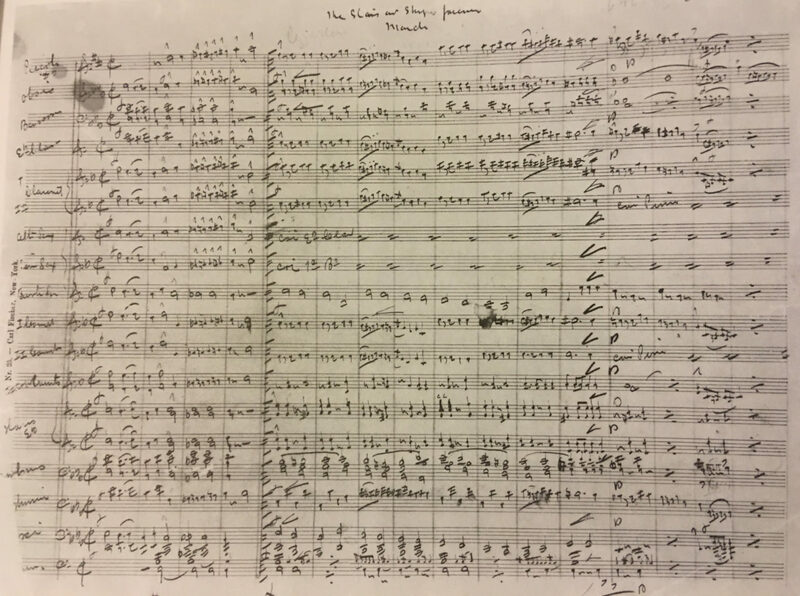 Its is interesting to note the first piano score has no title and the ink piano score has a title (called erroneously “The Star and Stripes forever”) that is in pencil perhaps indicating the title was added at a later date. Once the music was written as a piano arrangement, (Sousa signed the piano score “xmas ’96” he put the music aside. He must have taken the two piano versions with him on the tour that started on December 27 and then scored the work for band finishing it on April 26, 1897 in Boston. This was done while during a 5 month tour! 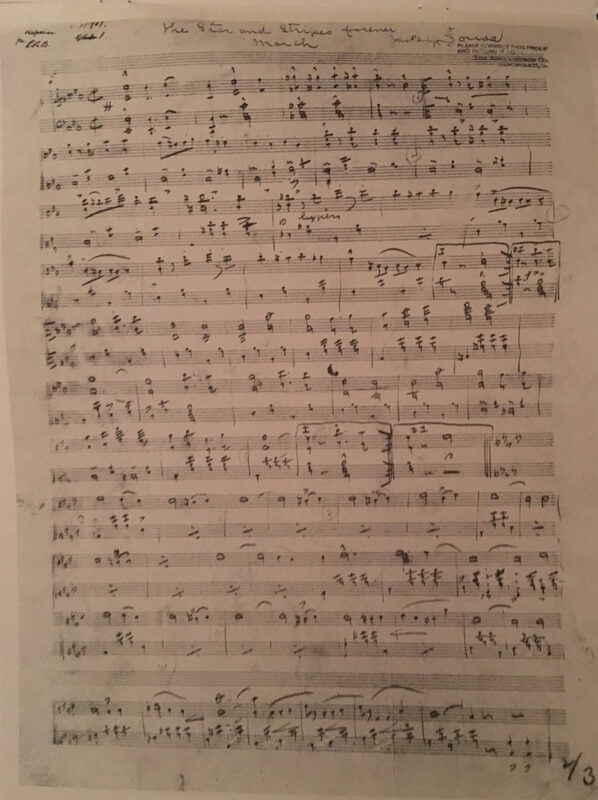 He scored the work for piccolo in D-flat, two oboes, two bassoons, clarinet in E-flat, two clarinets in B-flat, alto saxophone, tenor saxophone, baritone saxophone, three cornets, four horns in E-flat, three trombones, euphonium, tuba, and percussion. As for the name, “The Stars and Stripes Forever”. it no doubt refers to our flag. 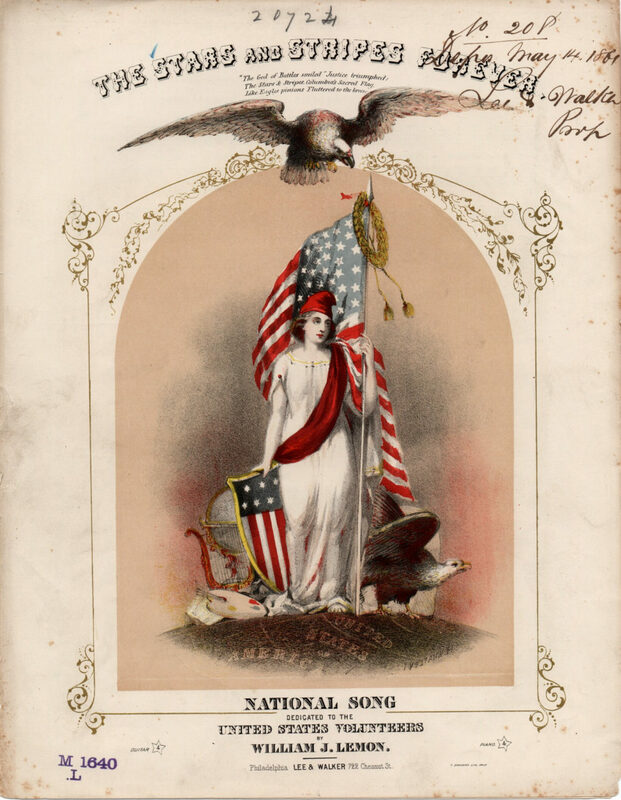 The term Stars and Stripes was used as a reference to the flag long before the march and several pieces of music under that title were published including one composed by William Lemon in 1861 and one written by Frank Armstrong and published in 1895. Sousa was more than likely familiar with the term and attached the title in the spring of 1897. By April 1897, the Sousa had been on tour for three months and working on the scoring of the march. According to the signed manuscript, he finished the work on April 26 in Boston. Sousa had in mind to premier the march in Philadelphia on May 14 to coincide with celebrations of a new statue of George Washington the city was planning. There is an indication that Sousa had promised or had been asked to write a new march for the occasion. On May 9th the Philadelphia Inquirer announced that a new Sousa march would be unveiled at the concerts and that the name of the new composition would be announced on May 14. So at the Philadelphia Academy of Music would be the place of the new work. But certainly Sousa would have rehearsed the untitled march ahead of time and there seems to be indications that he performed the untitled work as an encore selection as early as May 1 in Augusta, Maine. But certainly, the first announced performance was on May 14 in Philadelphia. Washington and Baltimore would hear the work within a few days when the band visited those cities. And the reaction? It was enthusiastic. Almost from the start the march seemed to hit the right chord with everyone. The first known recording of the march was made by the Berliner Recording Company on August 18, 1897 in New York, followed by Columbia in Washington. Later recordings by Edison and Victor were conducted by Arthur Pryor. Although Sousa would conduct performances of his march at virtually every concert until his death, only one recording of Sousa performing the march with his band which was made on August 7 1909 by Edison in New York is known to survive today. Sousa disliked recordings and radio, and most of the Sousa band recording sessions were conducted by Herbert L. Clarke. What is interesting in the Sousa recording of his own work, is his re-orchestration of some of the parts. Most notably is the addition of the octave leaps in the second strain and the octave dropping of the melody in the trio. Also a unique feature is the the repeat of the march, a practice that harken back to 19th century performance styles. Over the years “The Stars and Stripes Forever” has been performed and recorded by great bands and orchestras led by some of the world’s greatest conductors. It has been arranged into almost every conceivable type of ensemble and subjected to many interpretations including Jazz settings. It was also the basis for a ballet by Hershey Kay and was the title of a 1952 movie based on Sousa’s life. To celebrate becoming an American citizen, legendary pianist Vladimir Horowitz wrote a transcription of it for solo piano. He performed it at Carnegie Hall on March 28, 1945. A tradition (not knowing where or how it started) is clapping along to the first two strains and the Grandiose last 32 bars. This is reminiscent of Europeans clapping to Strauss’s Radetzky March. 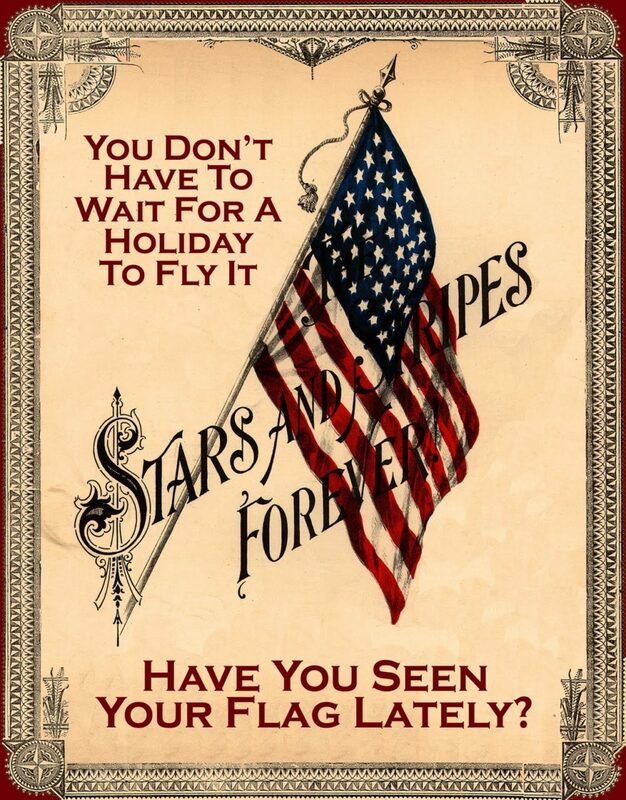 “The Stars and Stripes Forever” has also achieved a ceremonial status in the US military. The last 32 bars is used as a Honors March to recognize civilians who hold certain ranks. After a long effort petition Congress that began in 1915, it became the National March of the United States of America in 1987 through an Act of Congress. Lyrics were set to the march by none other than JP Sousa. The banner of the Western land. Is freedom’s shield and hope. The echo of the chorus grand. Sing out for freedom and the right. Is the flag of flags, the flag of Freedom’s nation. Hurrah for the flag of the free! The banner of the right. “The Stars and Stripes Forever” became a major part of every Sousa Band concert and is today played by the US Marine Band on every tour they make. Sousa conducted the march countless times and it was a staple of every concert he performed. 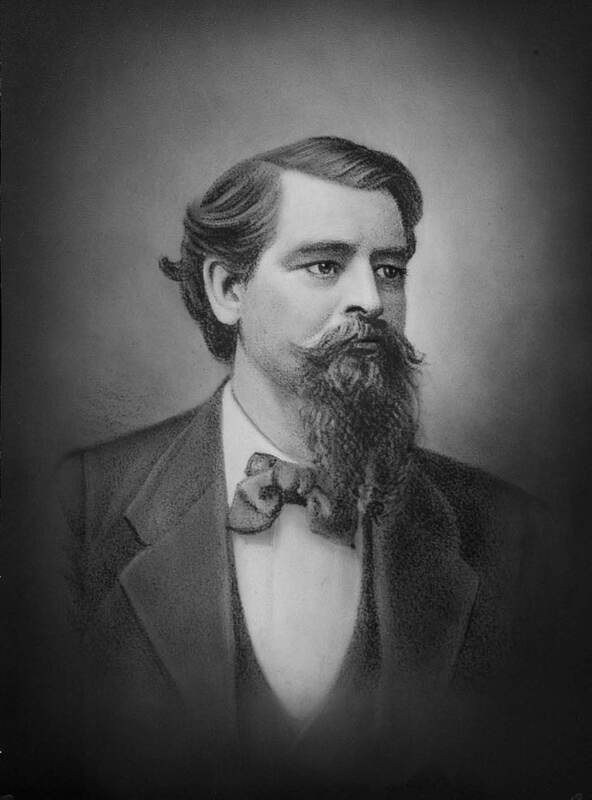 Sousa died in 1932 at the age of 77 in Reading, Pennsylvania after conducting a rehearsal with the Ringgold Band. Fittingly, the last piece he conducted was “The Stars and Stripes Forever.” As Ann M. Lingg wrote, “The Stars and Stripes Forever” has gloriously outlasted Sousa’s worldly life. It still stands a symbol of two of the finest American traditions-energy and optimism in an emergency-which have inspired its composition. 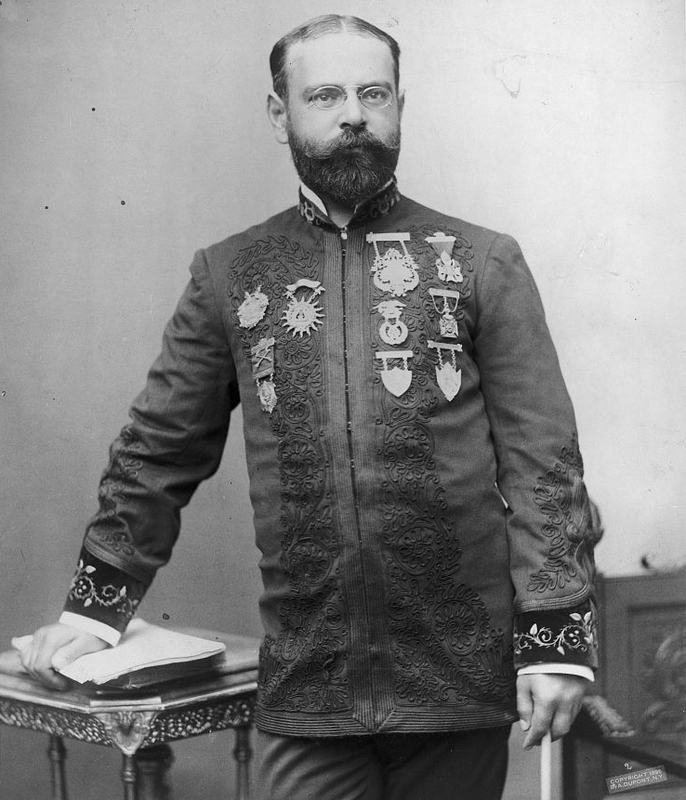 John Philip Sousa, 1854-1932, half-length portrait, standing, facing right. Date Created/Published: c1896. This entry was posted on Friday, December 22nd, 2017 at 6:00 pm	and is filed under Bugle Stories, Buglers Through History, General Interest, Getting Started on the Bugle, Jari's Articles, News, Uncategorized. You can follow any responses to this entry through the RSS 2.0 feed. You can leave a response, or trackback from your own site. Have always loved this march — we sang it in my high school chorus. It has to be the best march of all time! An original recording of the John Philip Sousa Band performing his composition “The Stars and Stripes Forever March” played on an Edison cylinder roll phonograph with a latest patent date of 1906. Home video made in the entertainment room of our Victorian house on November 1, 2012. Wow, inspired by the guy who wrote” it is well with my soul”? This is from the Mitch Miller special. Enjoy.